Plat du jour – Short Films! Computer Security: When a person leaves - access rights remain! Ombuds' Corner: How much does a smile cost? Across the PS complex - from Linac 2 to TT2 to the accelerator itself - teams have seen the closing of their retro-1980s entryways, and the opening of state-of-the-art access points in compliance with the highest nuclear safety standards. One of the new PS access points. The new PS access system provides more than just doors. Designed to protect against the radiation hazards and other risks caused by machine operation, the access system will monitor who goes into each zone, check whether or not the individual has the appropriate permissions to be entering, and even stop the beam if access is attempted during beam mode. "These new points provide automatic means to check that the right people are going in and in safe circumstances," says Pierre Ninin, project leader of the PS complex safety system. "All of these checks were previously done manually, so the burden on operators has been significantly reduced." The 19 new access points were successfully installed and deployed over the past year across 15 accelerator areas of the Meyrin site, covering the LHC injectors but also the AD, ISOLDE, the East Area, nTof and the EAR1 and EAR2 experiments. "Now we are performing hardware tests on the safety elements for the beam, which are responsible for stopping the beam on a physical level in the event of access to a zone," explains Pierre Ninin. "We are testing each safety chain, from sensors to actuators (which are Beam or Machine Important Safety Elements), as well as the Human Computer Interfaces that allow remote operation from the CCC. This commissioning requires close collaboration with teams from each machine." Working with HSE-RP, buffer zones were installed near each access point for temporary storage of radiological material. Each is equipped with the new TREC (Traceability of Radioactive Equipment at CERN) system. Although similar in many respects to the LHC access points, these new entryways incorporate feedback from LHC teams to improve the performance. "One major issue they highlighted was the maintenance of the access point itself, which requires the ability to access it from both sides," says E. Sanchez-Corral, deputy project leader. "In the LHC, the access points only allow this access when there is no beam! So, maintenance can only be carried out during shutdowns and, meanwhile, no one else can access the tunnel." The team have added a new door just upstream of each point, which can take over the function of the access point while maintenance is underway. It also keeps the interlock chain intact. "It's a simple addition, but it's one that will give teams days of extra access time during upcoming shutdowns," says E. Sanchez-Corral. But other teams need not worry, she adds: "These maintenance doors will also be installed at the LHC." A global test of all 15 zones - incorporating the access points and hardware security - will be carried out the first week of April. Immediately after, the accelerator hardware test will be carried out. Finally, the system will be validated in the so-called "DSO test" just before beam operation. If unauthorised entry is attempted at a given zone, the PS access system will stop the beam in that zone and downstream. Should any issues arise, the system will automatically stop the beam upstream. At the LHC, the SMACC project is progressing steadily: the W sleeves have been closed in four sectors, with closure in a fifth sector currently in progress. As for the electrical feedboxes (DFBA), the teams have already consolidated 9 out of the 16 boxes concerned. This work should be finished between now and the end of May. Congratulations to the SMACC teams, who have just closed their 1000th interconnection! The R2E project is in progress at Points 5 and 7 (where the cable pulling phase is now complete) as well as at Point 4 (where cable pulling is just starting). Point 1 will soon be tested for systems reactivation and Point 8 is completely finished. At Point 7, the new partitions designed to contain the air in the collimator area have now been installed. The automatic doors to allow access to these areas will soon be tested. The replacement campaign for irradiated cables in Building BA1 is almost complete: 95% of cable pulling is complete, 90% of connections have been made and 60% of tests have been carried out, which is all perfectly in line with the schedule. At the PS Booster and the PS, the teams are busy preparing for the hardware tests, which will begin on 28 March and should take six weeks. The Low Energy Ion Ring (LEIR) has now been reconfigured to its nominal vacuum condition. The final pieces of equipment are in the process of being connected. 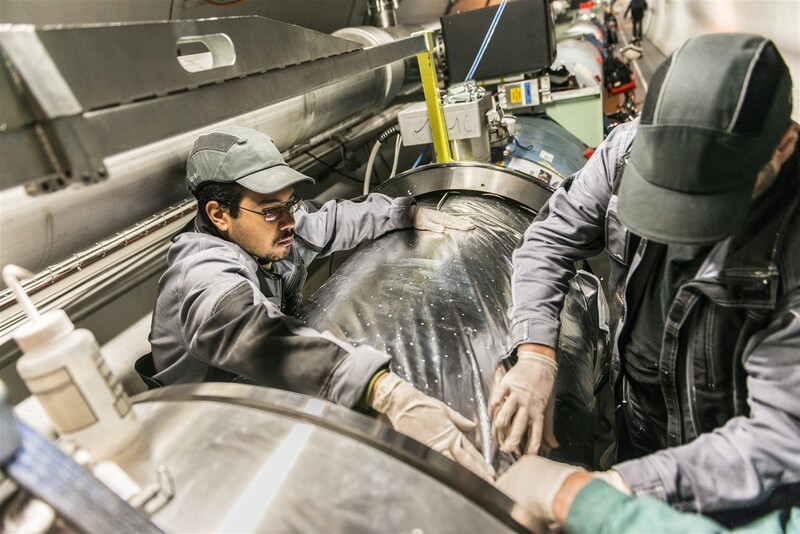 At the Antiproton Decelerator (AD), after several months in the CERN workshops, the BHN06 dipole and two injection kickers have been reinstalled in the machine. The new beam monitor has also just been installed and the bakeout campaign is in full swing.